When Thy Neighbor’s Dog Offends You! I have owned and loved many dogs over my lifetime. I have one now. But I must say, that it takes adherence to all of my Christian teachings to not complain about the 24/7 howls of my neighbors dog. 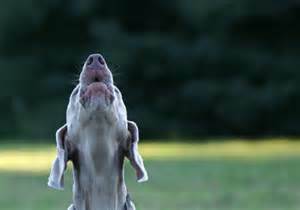 Indeed, the words written in Ecclesiastes, “… for a living dog is better than a dead lion,” brings into question if the writer was ever subjected to the constant howlings of a canine. I love my neighbors, they are wonderful people, but what to do when their dog offends me? I know they love their dog and I also know that “…a brother offended is harder to be won than a strong city…” (Proverbs 18:19), so I do not want to offend them by complaining. Yet, what to do? I can only think of the admonition of Paul that I need to ‘endure all things,’ so I am trying to do so. So please, say a little prayer for me, if you please, and help me to take comfort and hope in the words of Isaiah that my neighbor’s, “dumb dog will not bark; sleeping, lying down, loving to slumber…” (56:10) and that by so doing I too may also slumber and dream of a world where all dogs go to heaven, but where none can bark. « Ancestral Forgiving Has Its Roots In Godliness!